I saw Captain Marvel twice in the first ten days of its March 8, 2019, U.S. release. So, yeah, I liked the movie. We had big hopes for this one—the first Marvel movie with a female lead, trailing DC’s Wonder Woman (2017) by a little less than two years. I’d say those hopes were borne out. But my reaction was even stronger than that. Back in 1977, when I first saw the original Star Wars (A New Hope), I remember sitting around the next day and wishing I were back there again. Not in the universe of the movie, which is dangerous and in many places rather unpleasant; but in the story. Something about the overall effect of it, the ambiance, the mood or attitude, fired me with a kind of instant nostalgia for something I’d just seen. A curious feeling. Maybe that could be explained by the fact that I was young(er) and (more) impressionable at that time. But the day after I saw Captain Marvel, here I was again with this goofy fanboy reaction. It’s a kind of wild loyalty to a new discovery. You want to tell people about it, you put up the wallpaper on your computer desktop, you hunt up the soundtrack. And this at my supposedly-mature age. So I’ve been trying to figure out exactly why I find this movie so engaging. Since at this writing CM is still in theaters, I’m going to avoid spoilers; this post should be as safe as any current movie review or the trailers. If you haven’t seen the flick yet, I will say this: There are two “stinger” scenes, just as you expect from a Marvel movie these days, one in the middle of the credits and one at the very end. And be sure to pay attention to the Marvel logo that appears just before the movie starts: it’s an “aww” moment for longtime fans. Due to their long-running serial nature, and the reluctance of publishers ever to give up on a profitable property, comic-book characters tend to stick around indefinitely and, as a result, are prone to what TV Tropes calls Continuity Snarl. Their backstory gets more and more complicated, retconned, and re-adapted, until it becomes hopelessly incoherent. One of the virtues of the movie versions is that the writers have a chance to start from scratch and use only the elements they choose to build a new iteration of the character. Captain Marvel’s background is even more complex than usual. There have been five or six different versions of a “Captain Marvel” character (not even counting the Fawcett/DC “Captain Marvel,” now known for copyright reasons as “Shazam,” who has his own movie coming out shortly). That’s in addition to several iterations of “Ms. Marvel,” sometimes with the same person switching from one title to the other. A summary of this history can be found at Comics Alliance; and this Wikipedia page has a quick rundown of the various versions. Marvel Comics’ original Captain Marvel was a rather boring and angsty agent of the interstellar empire of the Kree (who look exactly like humans) named Mar-Vell, a young white-haired guy in an unimpressive green-and-white uniform. (Those who’ve seen the movie will note a distant connection here.) Mar-Vell is sent to Earth to find out what the heck is going on with these humans, after the Fantastic Four trounced a supposedly invincible Kree Sentry and then Ronan the Accuser. In the early comics, Marvel couldn’t figure out what to do with Mar-Vell. He engaged in slugfests with a number of established Marvel characters and suffered through a weepy romantic triangle. After about ten issues (Captain Marvel #11), the writers had an apparently godlike being named Zo give him new powers, after which he continued to do nothing much of interest. In issue #16, the Kree’s Supreme Intelligence changed his powers yet again and tossed him into an alternate universe called the Negative Zone, where he floats around until he periodically switches bodies with perennial Marvel kid sidekick Rick Jones, in a manner uncannily similar to that of the DC Shazam character (and also Jack Kirby’s Infinity Man, but that’s another story). Carol Danvers—the Captain Marvel of the movie (played perfectly by Brie Larson)—also appeared in this early era, but not yet as a superhero. She had a responsible position as security head at Cape Canaveral, but frequently she served as a mere damsel in distress, and as one of Mar-Vell’s two romantic interests. Altogether, not much promising material in this original incarnation of Captain Marvel. Now, I haven’t followed comics closely for many a year (one can’t read everything), so I wasn’t there for the renaissance of this character in the form we see in the movie. But as I understand it, the movie’s version dates only from 2012, when the character was rebooted by writer Kelly Sue DeConnick. In other words, this isn’t a cinematic presentation of an iconic character like Spider-Man, Captain America, or Thor. Here, the screenwriters elected to throw out a lot of the excess baggage of fifty years’ worth of comics. It was the right choice. One of my all-time favorite movies, The Right Stuff (1983), Philip Kaufman’s fact-based history of the NASA Mercury program, spends a lot of time with Yeager. Tom Wolfe, the author of the book on which the movie was based, considered Yeager the archetype of the test pilots from whose ranks the Mercury astronauts were drawn. Although Yeager himself never went into space, he exemplified the cool, confident, no-nonsense pilot who could take on any challenge and surmount it through a combination of superb competence and a fearless can-do attitude. The pilot with the “right stuff” has a certain contempt for the rules, along with all other limitations, and always takes danger lightly, preferably with cool wisecracks. This version of Carol Danvers starts out as a test pilot, with exactly that intrepid attitude. The movie isn’t shy about making the comparison. Carol passes through a Blockbuster Video store (the movie is set in 1995) and pauses to glance at a copy of The Right Stuff. We get a scene set at Pancho’s, the pilots’ bar that figures largely in that earlier movie. And we have a cat named Goose—a sly reference to Tom Cruise’s best friend in Top Gun, another movie about hot pilots (fighter pilots rather than test pilots). Carol embodies this insouciant, reckless competence. 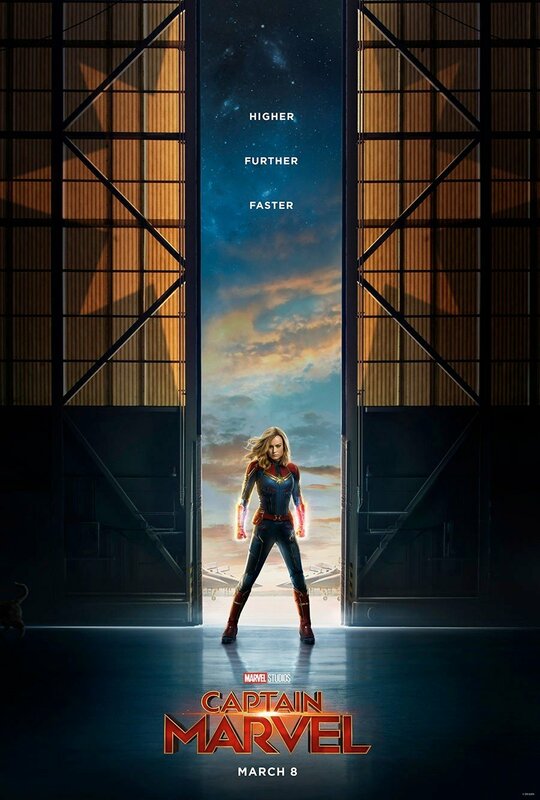 With another pilot, she exchanges a sort of catchphrase or motto—“Higher, further, faster”—from the title of one of DeConnick’s Captain Marvel comic sequences. It captures the test pilot ideal neatly. 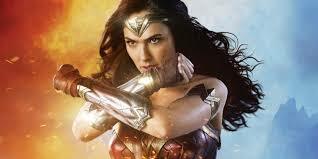 Comparison with Wonder Woman is inevitable—and, I think, instructive. These are both great movies with excellent main characters. But those characters play out differently. Diana is invincible; she always has been. She may have taken some knocks being trained by the Amazons, but she’s pretty much untouchable by anything humans have got. She takes on the Greek god Ares as an equal. There, to be sure, the contrast I’m trying to make falters a bit, because she’s outmatched by Ares until intense emotional strain—the loss of a loved one—causes her to claim her full power. And at that point she really is invincible. It’s glorious to see a woman who needs to fear nothing, splendid in her power, with a heart guiding that power to fight for the right. When she enters the world of normal humans, Diana brings a kind of intelligent innocence. 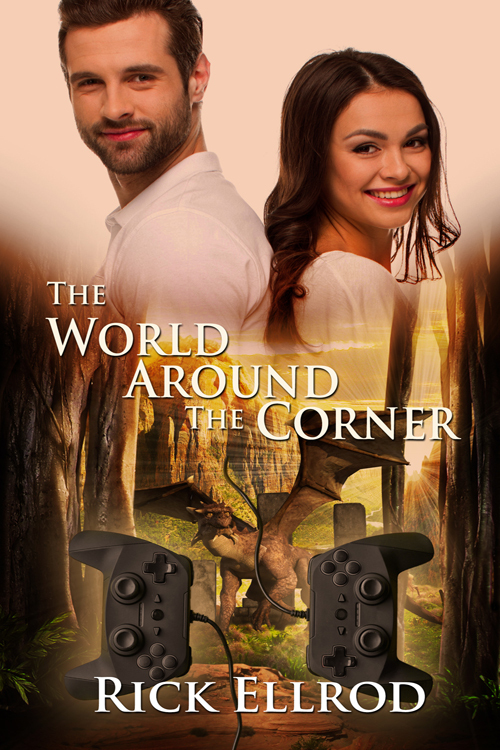 She learns difficult lessons about the complications of the human world, but that never really deflects her from her sense of justice (along with love or compassion). That’s what’s so great about her. Carol, on the other hand, has to earn her power. She doesn’t start out as an Amazon. First she must acquire her supernormal abilities; and then she has to learn how to use them under challenging circumstances (as celebrated in this Tor article). Carol also comes face to face with the complexities of the world—but not initially from a position of power. She has more of a character development arc than Diana does. Both heroes are a joy to see, coming into their power. But Captain Marvel is more vulnerable, emotionally if not physically. Despite the cool test-pilot attitude, the emotion that runs beneath is both her challenge and her strength. It’s easier to sympathize with her. There’s more in CM to admire. The star-spanning plot awakens that sense of wonder, of vast scope and open possibilities, that is science fiction’s strong point. But the real key, I think, remains in the character of the heroine. The motif of desperate heroism isn’t unique; on the contrary. Naturally our heroes are always fighting against great odds. But some stories are better that others at evoking that undaunted resistance to overwhelming opposition. This is one of them. In Larson’s brilliant portrayal, we see Carol’s stubborn courage, her indomitable resolve—and always with that particular mischievous touch that comes with the test-pilot package. To me, specifically feminine valor is especially poignant. And when you add that devil-may-care “right stuff” attitude, it’s irresistible. When Eowyn faces down the undead Lord of the Nazgûl at the Battle of the Pelennor Fields, I empathize with her defiant stand even more than with Aragorn’s or Frodo’s. Then add to this the reckless abandon with which Carol takes on her foes. She fights with flair. She takes the fight almost lightly in a sense, as if danger and peril hardly matter. Yet at the same time she never pulls per punches, much less gives up. It’s this, I think, that excites my wholehearted admiration. That’s my take on it so far. There are a lot of other fascinating angles to CM, but they’d involve spoilers. Maybe another time . . .